Finished life in 186th place. If you are like me, you will have chuckled at the ridiculousness of this line. If you are like me, you will have then thought of the truth in this line – and of how school perpetuates this truth when it insists on pushing all it’s students through the Standardized Test production line. I have never hid the fact that I dislike standardized tests. And this is a dislike based on research and discussion and even formed the part of my University degree for which I gained my first (and only) A+ for the paper I wrote about the topic in my final year of school. I have taken classes by the one half of the duo in New Zealand who authored the PAT (Progress and Achievement Test) who indicated that not only did their test contain inherent bias that was almost impossible to avoid, it only served as a basis for testing lower level thinking and computation skills. The New York Times is in a blogging frenzy over standardized tests with posts on the outcry over a contested question about a pineapple without sleeves, on parents choosing to keep their children home during tests, and from a staff developer on how testing is hurting teaching. I have read countless articles about standardized testing (read this, and this and this to get you started) and none of them do anything to make me want to throw up my arms and embrace the concept and the reality of the standardized test. Read Seth’s comment again: As long as we embrace (OR EVEN ACCEPT) standardized testing… Too often I am told, “Parents want to know”, “Other schools do it too”, “The kids have to practice for it”, “It will mean free tuition if they do well”. My fifth graders have seven more years of K-12 education ahead of them. Seven years! Can we predict what will happen in seven years time to justify pushing our kids through standardized testing today? I have worked with some of my kids for almost two years now, having been their fourth grade teacher as well. My kids are awesome. Different. Special. Talented. Unique. And so smart in so many different ways that it would blow your socks off. After 45 minutes of round one of ‘Test Prep’ for the SSAT, can you imagine how heartbreaking it is to hear a child say, “Wow. I thought I was smart but I guess I really am dumb!”. Heartbreaking. And so, so untrue. Yet the push continues. Shelly Blake-Plock followed the “21 things” post with this brilliant article that left me with goosebumps and the final tag line: DO SOMETHING IMPOSSIBLE. Are you willing to do just that? Make a ruckus! Our kids deserve it. Can you give me an idea of how many standardized tests a typical primary student would undergo in one year in the States? I hear and read so much about it but, working in an international school, I don’t see it. By the way, your photos and quotes that you add to your bogs are always very inspiring. Love the idea. It really does depend on the school. When I taught in North Carolina, we had tests weekly. 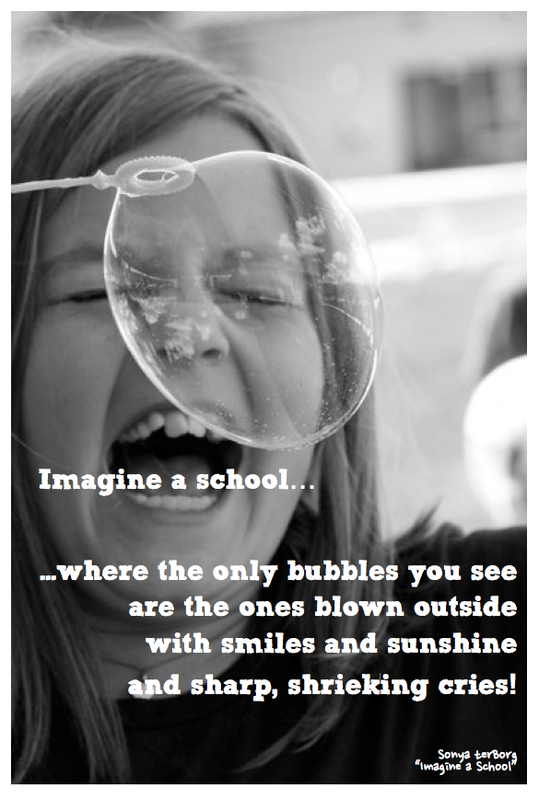 By christmas, we didn’t have art or music or PE anymore – those teachers came to help with bubble practice. Our scores were published each week and our school compared to other schools in the district. We were constantly under the threat of ‘take over’ where the admin would be replaced and stringent restrictions would be placed on the teachers (more so than we already had). The weekly tests were ten questions for reading, same for math. This was prep for the end of grade assessment. Again, this was 2002 and NCLB was an infant. What we do here is more in line with a typical international school – ACER testing. I just think we need to rethink why we are testing even if kids are only subjected to one or two days of it a year, if we don’t have a good purpose for doing it, why? Thanks for the comment about the photos. I have so many photos and it is nice to be able to use them for something inspiring!